Coach's Corner - BOTH Bush's hand signed Presidential hardback book. 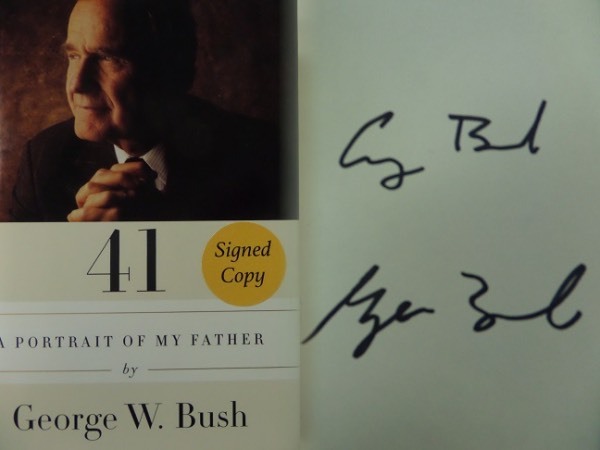 Go Back to Lot List BOTH Bush's hand signed Presidential hardback book. This mint hardback is "41-A Portrait of My Father" and includes the color dustjacket showing the just deceased 41s US President. It is a great read, labeled on the front by the book store as a "signed cop" and comes black marker signed by BOTH George H and George W. Bush. Value is $1200.00, "Great American" buy and hold investment is an easy one here, and just look at the always low opening bid price.